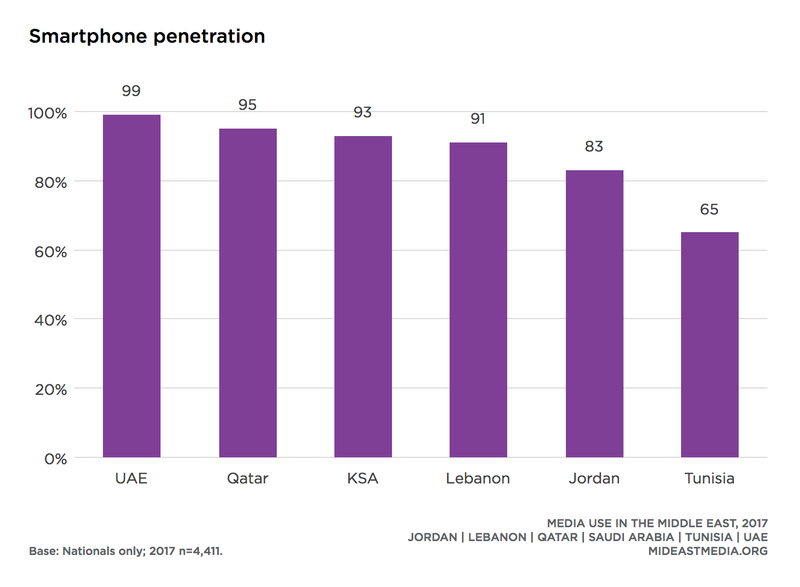 At least nine in 10 nationals in Lebanon, Qatar, Saudi Arabia, and the UAE own a smartphone as do 83% of nationals in Jordan and 65% in Tunisia. More than nine in 10 nationals under 45 years old own a smartphone compared to six in 10 of nationals 45 years or older, dropping to only one-quarter among nationals over 65 years old (under 45: 93%; 45-65: 62%, over 65: 26%). Only one-third of the least-educated respondents (primary or less) own a smartphone, much lower than nationals of all other education levels (33% primary or less vs. 79% intermediate, 90% secondary, 97% university or higher). This holds true even among older, yet highly educated, nationals. Smartphone ownership rises with education within each age group. Among the youngest group (18-24), less than two-thirds of nationals who have a primary education own a smartphone compared with all of those who are university-educated (61% primary or less vs. 100% university or more). Even among those 45 and older, nearly nine in 10 of the most educated group own a smartphone compared with only only two in 10 of the least educated group (20% primary or less vs. 87% university or more). Modest gender differences in smartphone ownership exist only in Jordan, Saudi Arabia, and Tunisia (six to nine percentage points), although significant majorities of both men and women own smartphones in all countries (Jordan: 86% men vs. 80% women; KSA: 98% men vs. 89% women; Tunisia: 69% men vs. 61% women; Lebanon: 90% men vs. 92% women; Qatar: 95% each; UAE: 100% men vs. 99% women). Nearly three-quarters of internet users across the region use Wi-Fi or mobile data services to connect to the internet (74% Wi-Fi, 72% mobile data service). However, Wi-Fi use varies by country, from less than half of Jordanians to two-thirds of Tunisians and nine in ten across the other nations (40% Jordan vs. 63% Tunisia, 91% Lebanon, 87% Qatar, 84% KSA, 97% UAE). 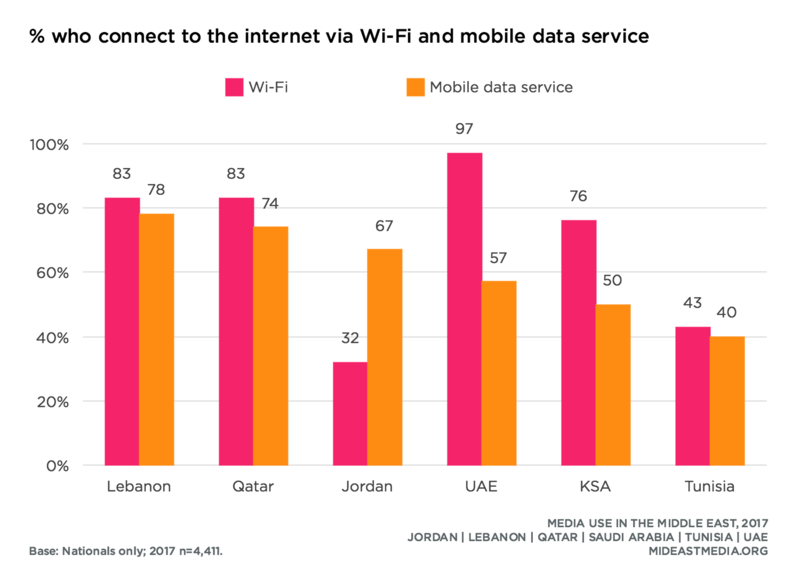 Significantly fewer nationals in Saudi Arabia, Tunisia, and the UAE use a mobile data service, which is the primary connection in Jordan (55% KSA, 59% Tunisia, 58% UAE vs. 84% Jordan, 85% Lebanon, 78% Qatar). Most nationals get news on a smartphone and do so every day (77% at all, 67% daily). Using smartphones to get news on a daily basis is especially high in Saudi Arabia and the UAE (80% KSA, 90% UAE). Majorities in the other countries get news on their smartphones on a daily basis as well (74% Jordan, 59% Lebanon, 59% Tunisia, 58% Qatar). The oldest and least educated nationals are the least likely to get news daily on a smartphone (41% 45+ year-olds vs. 76% 18-24 year-olds, 78% 25-34 year-olds, 73% 35-44 year-olds; 17% primary or less vs. 34% intermediate, 51% secondary, 62% university or more). Checking news on a smartphone every day varies little by gender (70% men vs. 65% women). Seven in 10 nationals watch news videos on their smartphone, and half watch them daily (69% at all, 48% daily). 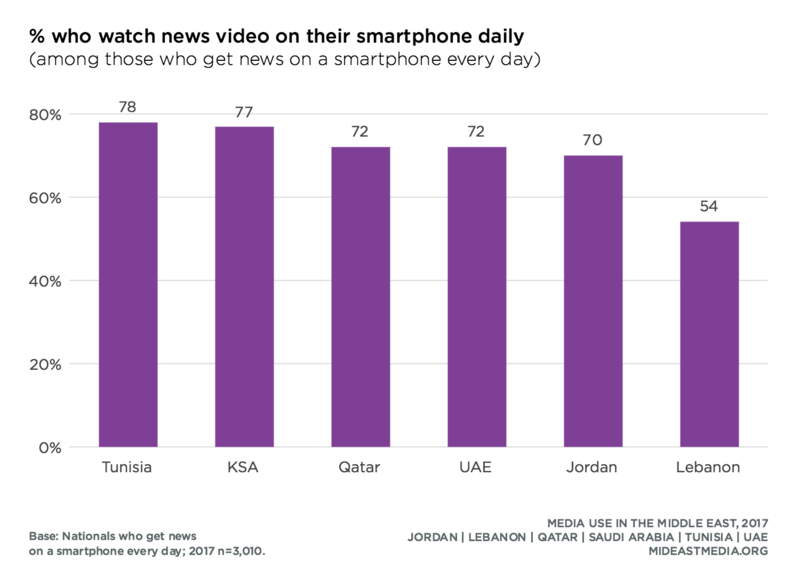 Lebanon is the exception with just one-third of respondents watching news videos every day on a smartphone (34% Lebanon vs. 52% Jordan, 43% Qatar, 63% KSA, 46% Tunisia, 65% UAE). Among those who get daily news on a smartphone, the proportion also watching news videos on their phone daily jumps to seven in 10 (70%). Watching news videos on a smartphone is less common among older nationals (45+ year-olds), women, and those less educated. Nationals 45 years and older are half as likely as younger respondents to watch news videos on a smartphone every day (27% 45+ year olds vs. 53% 18-24 year-olds, 57% 25-34 year-olds, 54% 35-44 year-olds). The disparity by education is great, with the least educated nationals (primary or less) watching news videos on a smartphone daily at rates two to three times less than their more educated counterparts (17% primary or less vs. 34% intermediate, 51% secondary, 62% university or more). Just over half of nationals use news apps, and just over one-quarter use them daily (55% at all, 28% daily). Using news apps is most popular in Saudi Arabia and the UAE and least popular in Qatar (use at all: 85% KSA, 86% UAE vs. 52% Jordan, 49% Tunisia, 42% Lebanon, 33% Qatar). Those who check news on a smartphone every day are not exclusively using news apps; 74% of daily smartphone news consumers use news apps and only 40% use them daily. Half of nationals say news apps are an important source of news and information, similar to the proportion using news apps at all (55% use at all, 50% say news apps are an important news source). 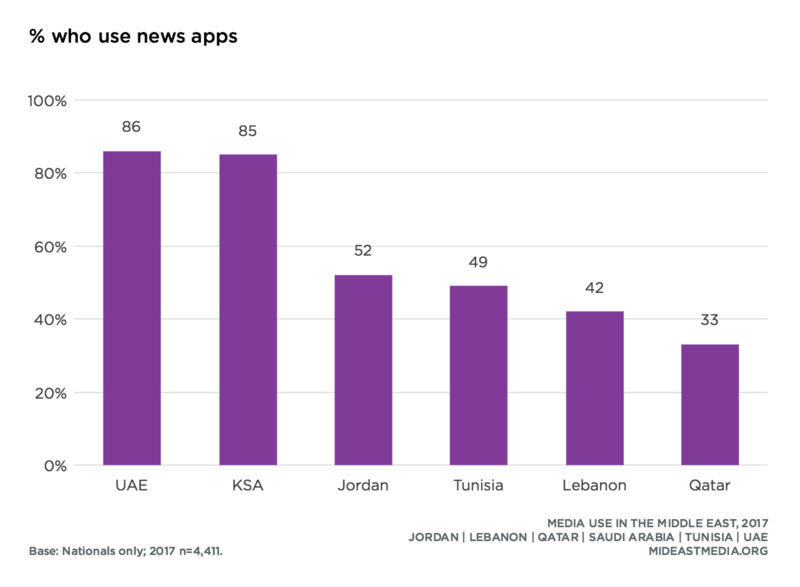 Only one-third of Jordanians and Qataris view news apps as an important source for news compared to more than 50% of nationals in the other countries (34% Jordan, 34% Qatar vs. 57% Lebanon, 54% KSA, 51% Tunisia, 78% UAE). While 85% of Saudis use news apps, only 54% say they are an important source for news, a 31-point difference. 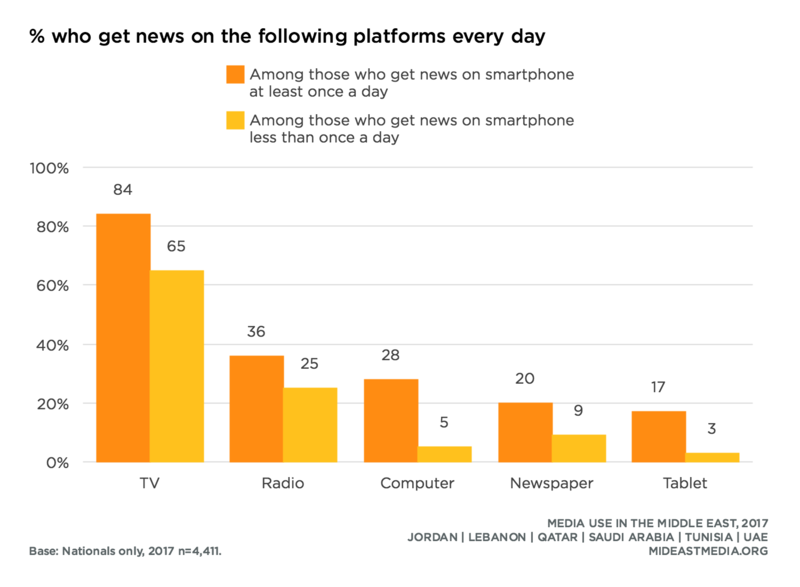 Similarly, 52% of Jordanians use news apps and only 34% say they are important, an 18-point difference. Comparatively, 42% of Lebanese use news apps, but 57% say they are important. Changes in the perceived importance of news apps since 2015 are mixed; a smaller proportion of Lebanese, Qataris, and Saudis rate them as important compared with 2015, while a greater proportion of Emiratis and Tunisians rate news apps as important in 2017 (Lebanon: 57% in 2017 vs. 65% in 2015; Qatar: 34% in 2017 vs. 44% in 2015; KSA: 54% in 2017 vs. 58% in 2015; UAE: 78% in 2017 vs. 70% in 2015, Tunisia: 51% in 2017 vs. 39% in 2015). Nationals who say consuming news from foreign media outlets is beneficial are more likely to rate news apps as an important source for news and information—by 10 percentage points over those disagreeing with the benefits of foreign news outlets (news apps are important: 58% agree foreign news is beneficial vs. 45% disagree).